This issue of kiteboarding.de – extra ‘fat’ with 150 pages – is dedicated to the chicks who rip, yeah, nice with a ‘Girls Special’. Kitegabi is proud to have 3 features in it! 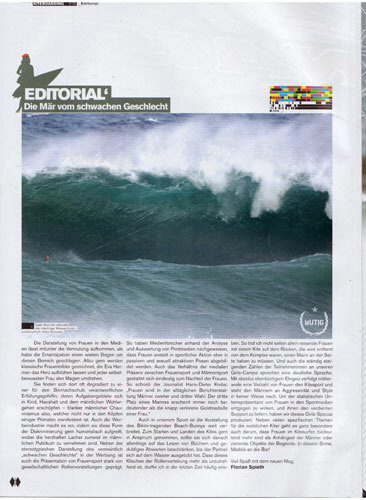 First I’m honoured that my favourite wave picture of all times has been chosen of the publishers to decorate the opening page with the editorial. Secondly I’m part of the ‘Girls Gallery’ that features the top girls in the World, amongst them: triple World Champ Kristin Boese, my team mate, the cutest kitechick of all times Angela Peral, furthermore Clarissa Hempel, Susie Mai, …and many more, nice !! Last but certainly not least as part of my column, I put together some ‘Travel Tips 4 Chicks’. As a professional ‘kite nomad’, i.e. traveling pretty much all year due to the fact that I’m from a landlocked country, covering my experience in packing (from clothing, to spareparts and more…). Check it out & Have fun ! KITEFITNESS – get ready 4 summer !